Norman Painting, the voice of Philip Archer on long-running Radio 4 drama The Archers, has died at the age of 85. 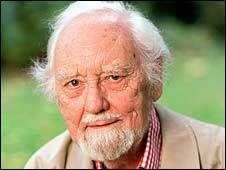 Born in Leamington Spa in 1924, the actor played the Ambridge farmer since the show's first trial run in 1950. Painting wrote more than 1,000 scripts for the show between 1966 and 1982. He also penned a best-selling book on the programme, first published in 1975. He is featured in the Guinness Book of Records as the longest-serving actor in a single soap opera. In recent years, though, his appearances on The Archers have been limited due to ill health. He spent what was to be his final day in the studio on Tuesday last week. His final episode will be broadcast 22 November, when Phil Archer character will be surrounded by his grandchildren, preparing for Christmas. BBC director general Mark Thompson said he was "deeply saddened" to hear of Painting's death. "He rightly became renowned for his portrayal of Phil Archer, a role he created in the pilot episode in 1950, but he was also a gifted writer and talented, versatile broadcaster," he said. "He was a pillar of The Archers family, but to millions of listeners he became a friend and latterly a wonderful father figure. "His death leaves us with a great sense of loss but an even deeper feeling of gratitude for such a huge contribution to the BBC and its audiences over six decades." The show's editor, Vanessa Whitburn, also paid tribute to Painting, describing him as a "consummate professional". She said: "Norman always wanted to remain working on The Archers until he died - and I am delighted and proud of him that he achieved his wish." BBC Radio 4 controller Mark Damazer said: "Norman Painting was for almost 60 years a central figure in one of Radio 4's hallmark programmes. "As Phil Archer, he became a wonderful patriarch yet he had started decades earlier as a young romantic hero. "He will be deeply missed by the rest of The Archers team and his millions of fans." Appointed OBE in the New Year's Honours for 1976, he was vice-president of the Tree Council and the only honorary Life Governor of the Royal Agricultural Society of England. His autobiography, Reluctant Archer, was published in 1982. In 2000, the actor revealed he had been diagnosed with bladder cancer but said it would not stop him recording episodes. "I see no reason why this illness should prevent me from continuing doing what I love ," he said at the time. Over the years Painting's pragmatic character has been involved in numerous key storylines. One long-running plot strand revolved around who would inherit Phil's farm after his retirement. One of his most dramatic moments, meanwhile, occurred in 1955 when his first wife Grace died in a barn fire while trying to save a horse. "Even when I'd read my script, I didn't really believe it was going to happen," Painting recalled on the 50th anniversary of the famous episode. It is widely believed the BBC scheduled the death deliberately to clash with ITV's first broadcast. In more recent years, the character - a former president of the National Farmers' Union - had been enjoying a quiet retirement, playing the church organ and photographing the heavens.